With its true taste Monin Blackcurrant syrup allows you to create amazing drinks such as Martini, Mocha and much more. The basis of many popular cordials and alcoholic drinks, blackcurrant is used in the famous French champagne cocktail the Kir Royal, as well as the standard Kir made with white wine. Felix Kir, mayor of Dijon (1945-1967), popularised the drink by serving it at his receptions. 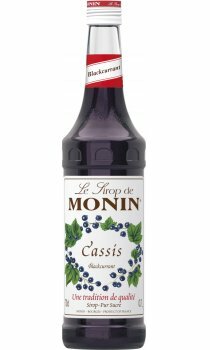 Simply add Monin Blackcurrant syrup to champagne for a delightful Kir Royal, to cider or beer to make the popular cider and black or lager and black or mix with other fruit flavours to make refreshingly fruity cocktails.